With an ASP women’s world longboard title added to her resume, Oahu’s Kelia Moniz has a lot to smile about. It took a couple of days to for the collective surfing world to find out Kelia "Sister" Moniz won the ASP Women’s Longboard Championship at the Swatch Girls Pro. Perhaps it was due to the Facebook ban in the People’s Republic of China. Or, maybe the first jewel of the Vans Triple Crown of Surfing overshadowed thesingle-event longboard championship. Whatever the reason, Kealia’s first world title at the age of 19 is a milestone achievement. When she was born it took a month for her parents Tammy and Tony Moniz to name Kelia so she inherited the nickname "Sister" from her older brother, Micah, during those four weeks. The Hawaiian/Japanese/Chinese/Portuguese/Irish longboarder’s first name is actually Greek for "beautiful." Although she splits time between Hawaii and California these days, Sister still considers Honolulu home. ESPN caught up with Moniz in Waikiki during a Roxy beach day to talk story about the Chinese surf scene, the world title, her legendary father, Tony, and what makes longboarding so cool. What’s the surf scene like in China? There’s no scene. It was only us, who flew in for the contest. The surfing scene is very new to their culture and that’s why they’ve been running events in China to kind of grow the sport within their culture. There’s so much potential there to be world class surfers because there are waves all over Hainan Island. We only surfed three spots on that island and there are so many pockets that are constantly breaking that nobody really knows of. They kind of keep it a little secret, but for the most part the Chinese government is trying to build a tourist attraction with Hainan Island and I think surfing can be a really big part of that. Where would you could compare the Hainan Island waves that you surfed to in the U.S.? The original spot they were supposed to hold the eventon a good dayis a perfect, left-hand point break that I would surf all day if it was breaking. Unfortunately, we had to move [contest] sites on the last day, and the second spot they [ran the contest] was actually like Queens a little bit. Moniz on the podium after winning her title in China this November. That wave seems well-suited for your style of surfing since you grew up sliding Waikiki. It was perfect for me! I went in after my semi and before my final and Kai Sallas was kind of giving me feedback and said, "just pretend like you’re surfing Queens because it looks like it and you’re surfing it like it is and have fun." That’s what I did in the final and it worked to my advantage. Beside Kai Sallas, who was your support crew in China? My mom was my number one support. Then the other girls from the contest: Natalia Smith from Kauai and Crystal Dzigas. It was nice to have full-Hawaiian support there. And all the boys: Nelson [Ahina], Keegan [Edwards], Kai [Sallas], Uncle Duane [DeSoto] and Ned Snow. What was your first thought after the horn sounded and marked the end of the final? It was crazy because we didn’t have live scoring. We had to change the whole contest site so they only took over one tent for the judges and there was no P.A. So there was no live scores and I had no idea. I had an idea that maybe I won because Chelsea [Williams] wasn’t completing here waves, but it wasn’t official so I didn’t want to claim it yet. So I went in and once I got to the beach all the boys were on the beach and had their hands up cheering for me. Then all the cameras came over to me and then I had a good idea. Then the announcer came up and made it official that I won. I was on top of the world at that moment, and the boys chaired me up the beach. It was a really, really good moment for me and I was so stoked! What was it like to be in the SWATCH Girls Pro China final with Chelsea Williams for the second consecutive year? It was cool. It was kind of like a rematch I guess. Unfortunately for Chelsea — I was really bummed for her — because last year she won and she killed it, but she didn’t get a [world] title. This year we had waves and it was definitely fair because we both got waves, but I just got the better half this year I guess. What is the future for your competitive career? I don’t love to compete because I get into the zone and don’t know how to balance competing and just being normal. When I’m in the zone I really block everything out, I focus really hard and I don’t really have fun with it. Moniz, grace and beauty in the water defined. How was it growing up in your father’s shadow? For my dad, it was a path he created for my brothers and I. He was well-traveled, and till this day now, I go anywhere in the world and people don’t know me for my name, they know me for my last name. Once they find out I’m a "Moniz" it’s a much different respect I get instantly and I’m so grateful for everything my dad has done in positive way for our family. When we go to different surf spots, wherever we go people want to give us waves and be extra nice. People have a respect for my family and it’s nice to have that when you come into the surf industry because it’s so small and so big at the same time. 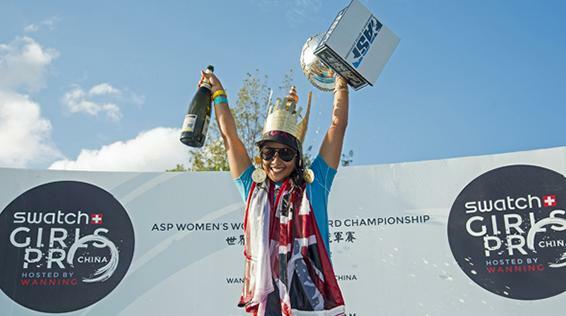 It seems like this ASP women’s world longboard championship title is helping you create your own identity. Yeah, definitely even from my brothers because we were always recognized as a family group. Especially for me because longboarding is different from shortboarding. [Longobarding] is in the shadow of [shortboarding] so you really have to do something big to standout in longboarding. I do a lot of modeling with Roxy and it’s cool that I can see that I actually did something [by winning the women’s longboard world title]. What do you think it’s going to take for longboarding to emerge out of shortboarding’s shadow in the surf industry? There’s so much potential in women’s longboarding because it’s so much more approachable for the average person. For the average girl who is watching someone longboard it’s like "oh wow, I can do that and maybe I can be a professional surfer one day." So I think there is a lot more to offer and we [female professional longboarders] can attract a bigger audience because girls will want to try to do that one day. I think there is so much potential for women’s longboarding to grow and with this world title I think I can help that and help women’s surfing to grow in general. I grew up longboarding. I grew up in Waikiki. I grew up looking up to longboarders and it was something that naturally happened. My brothers grasped on to shortboarding and went that route. I kind of did a little bit of shortboarding, but I always turned back to longboarding. I guess at the end of the day it was because [longboarding] was fun. You can get on a longboard on a flat day and have just as much fun as if it’s five-foot and perfect. For me it’s just more fun and there is more opportunity to be stylish on a longboard and that’s kind of what my whole deal is.